Women will also have something to be excited for this Holiday Season for Jordan Brand will be releasing tons of shoes not only for men, but for them as well. 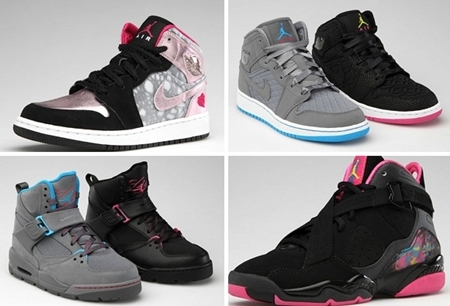 Known as the Jordan Brand Girls Holiday 2011 Collection, Jordan Brand will be releasing a stunning collection headlined by the black/desert pink colorway of the Air Jordan 14 and girl-themed colorway of the Air Jordan 8.0 next month. Also included in the Jordan Brand’s Holiday treat for women are women-schemed editions of the Air Jordan 1 Phat, Jordan Flight 45 TRK, the Jordan Flight 45, the Jordan SC-2, the Jordan TC, the Jordan Sky High Retro and the Jordan Courtside. Girls should watch out for it and make sure to grab one or even more than one model this coming Holiday season! Air Jordan 2011 Q Flight Now Out! Three New Air Jordan 2011 Q Flights Coming Out!